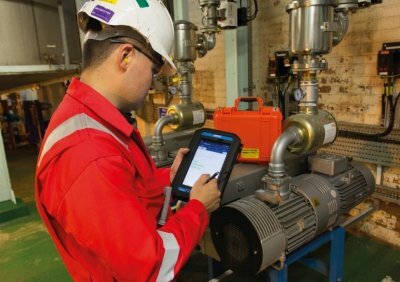 Read-out Instrumentation Signpost: Phone & tablet in industry. The Ex-Handy 10 Featurephone and the ATEX/IECEx Zone 1/21; Div. 1 version of the industrial tablet Tab-Ex 02 has been recently introduced by Pepperl+Fuchs. 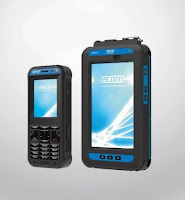 The in-house developed Zone 1/21 certified 4G/LTE Featurephone Ex-Handy 10 with Android 8 operating system is the ideal enabler and companion for innovative industrial 4.0 applications in hazardous areas. The latest member of the ultra-robust Ex-Handy family, developed since 1994, enables the use of push-to-talk (PTT) solutions over 4G as well as private LTE and Wi-Fi networks. This ensures optimum network coverage in all areas and situations – with low network latency and excellent data transfer rates. Speakers positioned at the front of the mobile device provide optimal voice and sound quality – even in noisy environments. Dedicated, easy-to-use side buttons – large PTT and red emergency button – allow quick access to PTT and alarm services via one-touch. In addition, the automatic, lone worker protection function can be implemented application-specifically and can (server-dependent) be integrated into the company's IT. The high-resolution, brilliant display of the Ex-Handy 10 is protected by extremely resistant and scratchproof gorilla glass. It features protection class IP68 and withstands permissible ambient temperatures from -20 °C to +60 °C in harshest industrial environments. The feature phone offers maximum planning and investment security thanks to very long availability and support (5-year lifecycle) as well as global approvals (explosion-protection, country-specific product conformity and a wide variety of radio bands). With the Android 8 operating system, continuous security updates via FOTA (Firmware Over the Air) and its own software development team, the Ex-Handy 10 is future-proof. In addition, its highly developed and powerful rechargeable battery paired with advanced energy management allows operating times above average. A consistent, compatible product ecosystem with its own 3.5 mm audio jack connector fixation concept and neues ecom Radio Speaker Microphone (RSM) as innovative PTT sets, scan applications and BLE beacons complete the offer. The ATEX/IECEx Zone 1/21; Div. 1 version of the new industrial tablet Tab-Ex 02 is successor of the world's first explosion-proof Android tablet Tab-Ex 01. The Tab-Ex 02 combines highest performance with innovative applications such as augmented reality. Equipped with an Android 8 operating system, the Tab-Ex 02, based on the Samsung Galaxy Tab Active2, features a powerful Octa Core processor with 1.6 gigahertz and 3 gigabyte RAM. It is ideally suited for industry 4.0-capable applications and simplifies data exchange with SCADA/DCS systems, merchandise management systems (SAP, IBM Maximo), project management systems and computer-aided system planning. The compact Tab-Ex 02 is the perfect and worldwide approved companion for various tasks, including inventory, material tracking, maintenance, supply chain and asset management up to a professional solution for lone worker protection.